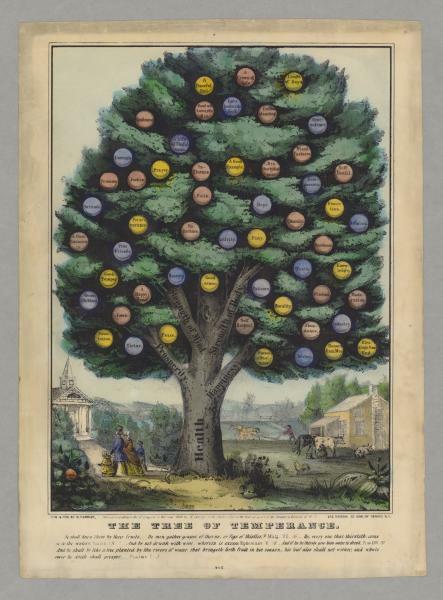 The Tree of Temperance was published in 1849 by Nathaniel Currier. A later version of the print was published in 1872 by the firm of Currier & Ives. Currier and Ives were successful lithographers during the mid-nineteenth century. They left a pictorial record of their times which is now considered Americana of "the good old days." And who hasn't seen a holiday card with a Currier and Ives print on the cover? Their prints sold by the thousands for five to twenty-five cents apiece and never for more than three dollars apiece. Lithography was short-lived, however. It was replaced by chromolithography, photography, and photoengraving by the end of the nineteenth century. Their work was considered passé for decades and much of their work was discarded. Fortunately, during the 20th century, their work was rediscovered by collectors and has been preserved. Nathaniel Currier was born March 27, 1813, in Roxbury, Massachusetts, and died on November 20, 1888. He became an apprentice at age fifteen in a successful lithography firm in Boston and as a young man developed a successful business of his own in New York City. He had a natural talent for knowing what would interest his customers, such as his print of the steamboat Lexington on fire. James Merrit Ives was born March 5, 1824, in New York City and died January 3, 1895. He left school at the age of twelve and started working, but he was always interested in art. He taught himself by studying in galleries, libraries, and museums. Ives began work as a bookkeeper for Currier in 1852 and became a partner in 1857. He was finally able to use his talent in art by contributing to the drawings and managing the staff artists. Both Currier and Ives had an instinct for giving the public what it wanted to see. The slogan for their company was "publishers of cheap and popular pictures." Their prints incorporated elements of danger, death, and sentiment. Their illustrations of the fate of the drunkard helped to frighten a generation into a temperance movement. The Drunkard's Progress was a popular temperance print, and a print similar to the Tree of Temperance, published in 1849, was the Tree of Life. Lithography was the art of drawing pictures on stone and transferring them to paper, after which they could be hand-colored. The process started by cutting a piece of porous stone like slate into a flat, rectangular block. The surface was prepared by grinding it, giving it a velvety and delicate surface texture. Then it was carefully sketched upon with special lithographic crayons made of water-repelling substances. After the sketching was completed, the stone was washed in acid, placed in a press, and covered with a special, greasy ink. Paper was then placed on the inked plate, pressure applied, and a print was pulled off the press. The prints were affordable and popular, and purchased by rich and poor alike, nation-wide. Lith. & Pub. By N. Currier, Entered according to Act of Congress in the year 1859 by N. Currier, in the Clerk's Office of the District Court of the Southern District of N.Y. 152 Nassau ST. COR. OF SPRUCE N.Y.
Ye shall know them by their fruits - Do men gather grapes of thorns, or figs of thistles? Matt. : VII. 16_ Ho, every one that thirsteth; come ye to the waters, Isaiah, I.V. 1. And be not drunk with win, wherein is excess. Ephesians V. 18... And if he be thirsty give him water to drink. Prov. XXV 21 And he shall be like a tree planted by the rivers of water, that bringeth forth fruit in his season, his leaf also shall not wither; and whatsoever he doeth shall prosper. Psalms 1. 3..
Author/Creator: N. Currier (Firm), lithographer. Dimensions: image and text 34 x 22.5 cm., on sheet 37 x 26.5 cm.